One of the more recent collections from the holdings of the John F. Kennedy Presidential Library to be fully accessible in the digital archives is the White House Staff Files of Harris Wofford. Mr. Wofford worked as an assistant to Senator John F. Kennedy and later as the Special Assistant to the President for Civil Rights from 1961 to 1962, heading the Subcabinet Group on Civil Rights. In May of 1962 Mr. Wofford was appointed Peace Corps Special Representative for Africa. 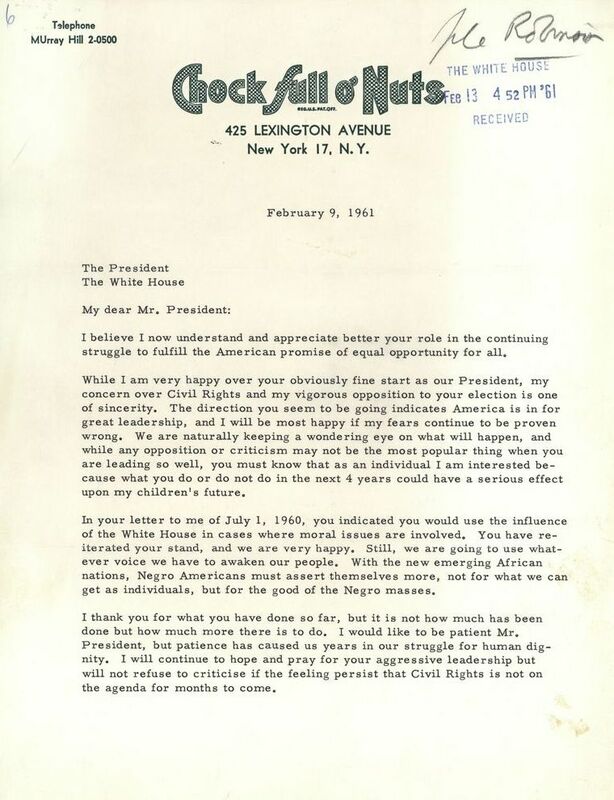 The collection consists of four series: Alphabetical Files, 1956-1962; Civil Rights Progress Reports, 1961-1962; Speeches, 1961-1962; and Audiovisual Material, 1960. 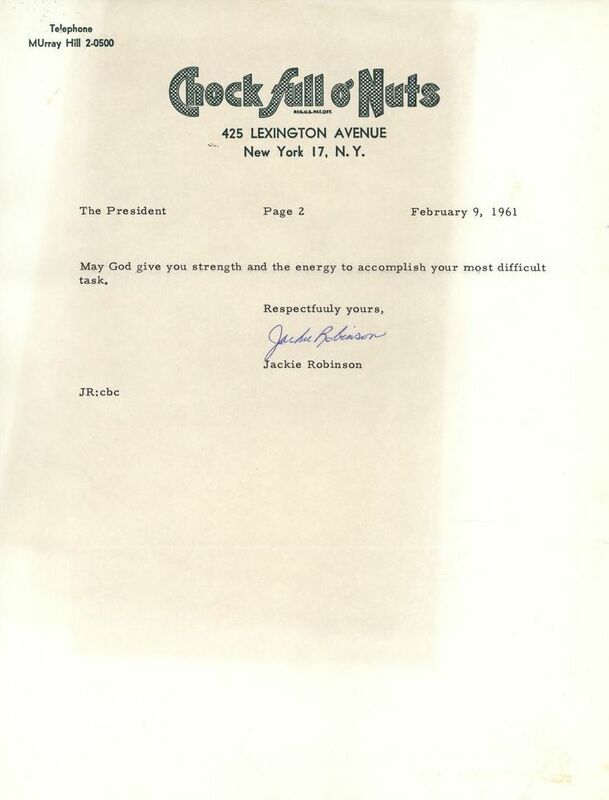 (Below) Letter from Jackie Robinson, Vice President of Chock Full o’ Nuts and former baseball player, to President Kennedy urging him to do more for civil rights. Mr. Wofford worked diligently in his role as the Special Assistant for Civil Rights to promote equality within federal departments and agencies. He also encouraged equal opportunity in employment and housing, and battled discriminatory practices in public areas. 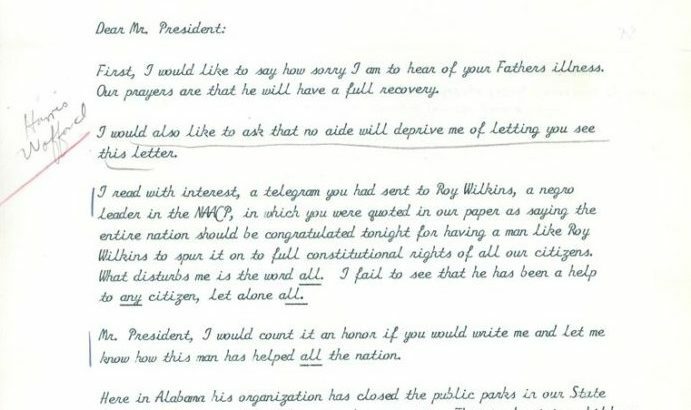 Letter to President Kennedy from Bettye Frink, Secretary of State of Alabama, on Roy Wilkins of the NAACP, and the integration of public parks. View entire folder here. 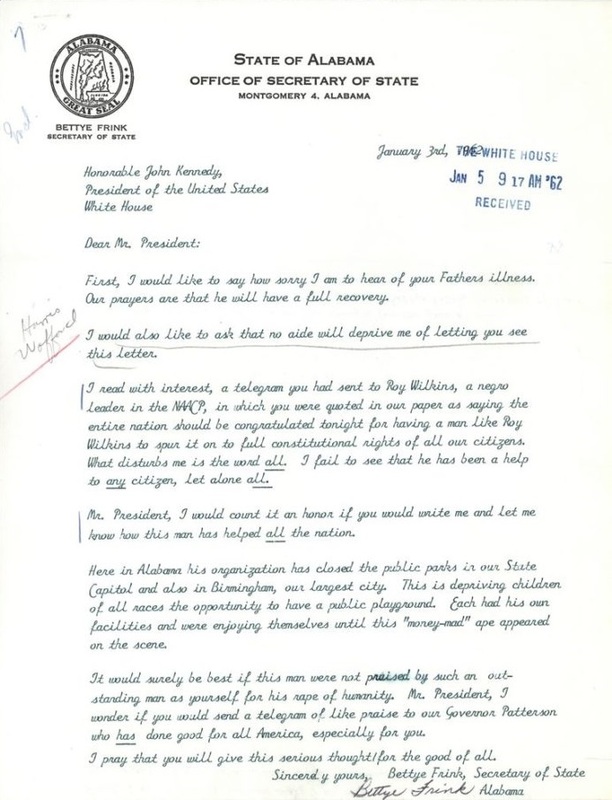 Examples of documents in the collection include correspondence with various persons on the topic of civil rights and the integration of educational institutions; correspondents include Roy Wilkins, Executive Secretary of the NAACP, (National Association for the Advancement of Colored People) and members of the Southern Christian Leadership Conference. 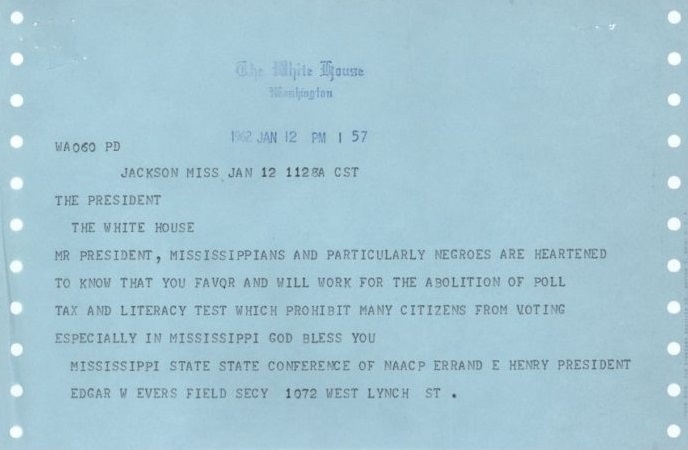 Telegram from Edgar W. Evers [sic] (Medgar Evers), civil rights activist and the NAACP field secretary for Mississippi. View entire folder here. Special thanks to Timothy A. Bowen, Kelly Francis, Olivia Mandica-Hart, and Lara Ullman for all their work to make this collection available online.